The Most Amazing Life Size Floor Lamp Sculptures! The Most Incredible Life Size Lamp Sculptures for your Home! I could not contain my excitement and decided I had to include them here on my website! They are among the coolest home decor ever! I had no idea there were so many out there! One more unique than the next! 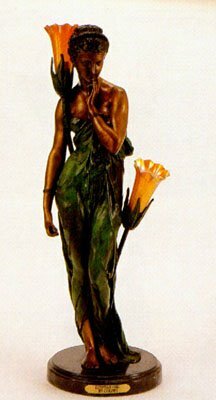 *This one in the picture is a very cool and highly detailed Egyptian girl sculpture lamp made from bronze. I love the two gorgeous and huge glass flowers that will give a beautiful glow when you turn it on! Perfect to have next to your couch or hall table! Beautiful gift idea as well! I love the antique bronze finish! According to the size of your living-room, you can have one or even two (or more of these). They look really nice right next to your sofa set or by your entrance. Beautiful Lamp Sculptures for Sale! Now it’s time for all the mermaid lovers out there! Are you a huge ‘mermaid’ fan too? Then bring them to your living-room! Not only one, but two beautiful entwined mermaids holding a light life-sized sculptural lamp! Can you imagine your guests’ reactions when they see your gorgeous ‘mermaids’? I love their verdigris bronze finish. Two mermaids are too much to handle? Then get a single mermaid floor lamp for your living-room instead! How gorgeous is this extremely unique mermaid sculpture floor lamp? I’ve never seen one like this before! Perfect mermaid decor piece for any mermaid lover! Find a cool corner for her and enjoy! It is very tall as well and will stand out and definitely ‘wow’ all your guests when they see it for the first time! Best Life Size Bronze Lamp Sculptures! This beautiful and impressive peacock Goddess holding a torch is also among the best life-size floor lamp sculptures being sold right now. If you have always wanted to meet a ‘Goddess’ in person, this is your chance! She will definitely look amazing by the entrance door, won’t she? This is your floor lamp! 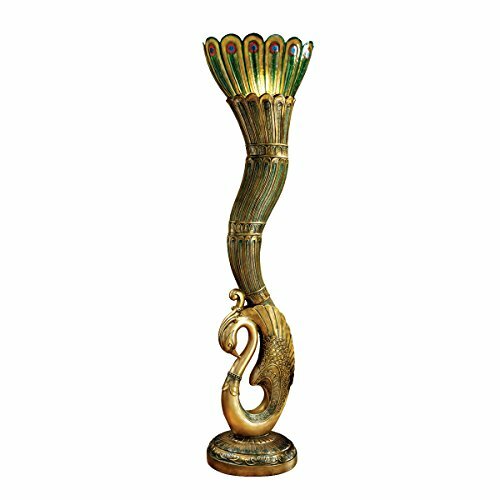 It is an amazing peacock sculptural floor lamp for sale! I love the colors, especially the beautiful gold finish! Very elegant and unique floor lamp! If you are looking for the most beautiful peacock lamp sculptures for your home, this is one of the most popular ones! Buyers love the ‘antique’ look and colors and they say it’s a very elegant peacock lamp! Very Modern Life-Size Lady Floor Lamp Sculpture! This lady lamp sculpture so far is the most impressive life-size floor lamps around! I let out a scream the first time I saw her! It is actually a fashion lady, wearing a nice dress and beautiful boots, and her head is the lamp! How cool and unique is that folks? If you are also into cool and modern home decor, I believe you’re really going to like this lamp! 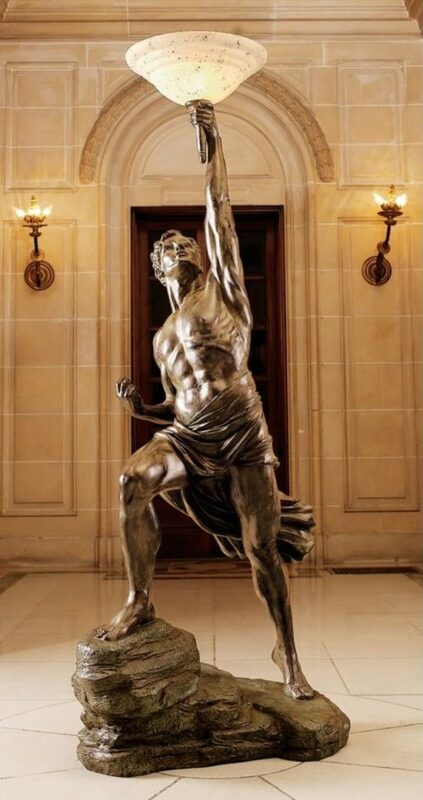 How about having Prometheus inside your home? I bet you will never be in the dark again! This is a very impressive and highly-detailed realistic Prometheus sculpture floor lamp for sale! Buyers said it exceeded their expectations! I love his gorgeous color and finish! Are you into Egyptian home decor too? Then you are going to love this life-size King Tut lamp sculpture! He is actually over 6-feet tall! Will definitely stand out in your living-room! The Most Impressive Life Size Sculptural Lamps for Sale! 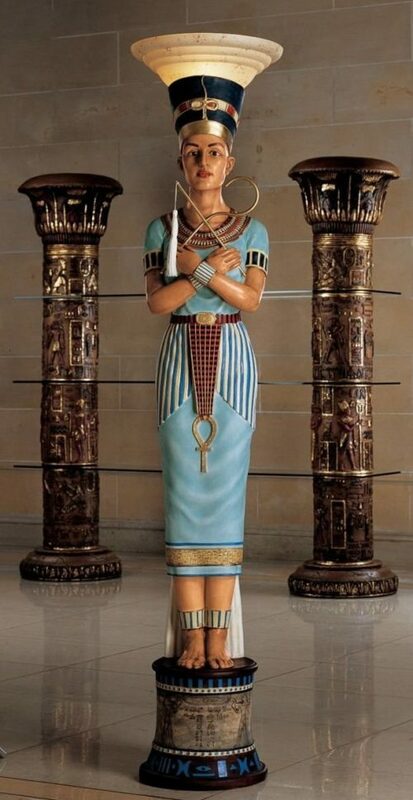 Are you a fan of Queen Nefertiti? 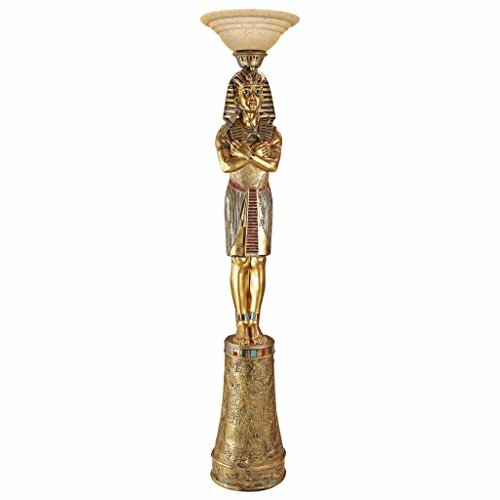 Then this beautiful and amazing life-size Queen Nefertiti floor lamp sculpture is for you! Look at her beautiful colors! I love her Egyptian blue dress! Your home will definitely look like ancient Egypt! 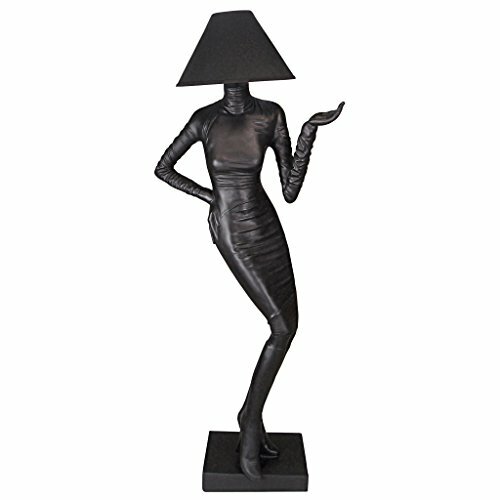 This is one of my favorite woman life-size lamp sculptures for sale! 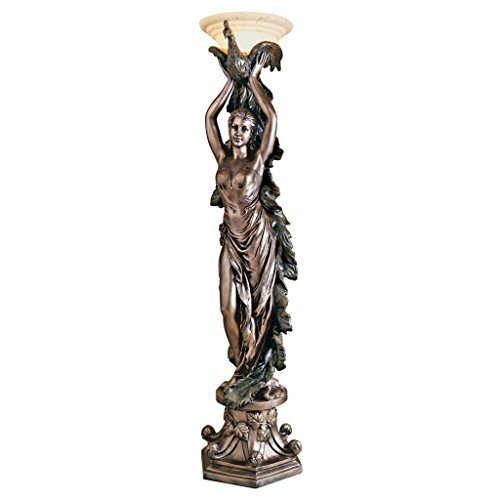 It is a beautiful and unique 19th-century French antique replica neoclassical maiden floor lamp! I love the green lamp shade she is holding! You can use a regular 60 watts bulb. She will look beautiful anywhere you place her! She is actually the maiden of light! It is very beautiful and will keep your living-room nice and bright at night! She is carrying a beautiful green torch light! This is the most exotic and unique woman lamp I have ever seen! She is reproduced in solid bronze and mounted on a marble base! As you can see the large flowers serve as the ‘lamps’ and they have a gorgeous soft glow! Another gorgeous and very impressive woman lamp! She was also hand-crafted in solid bronze! I also love the multi-colored patinas. What an exquisite gift she will make! The Most Impressive Lap Sculpture for Sale! I present to you the most impressive lamp sculpture for sale ever! 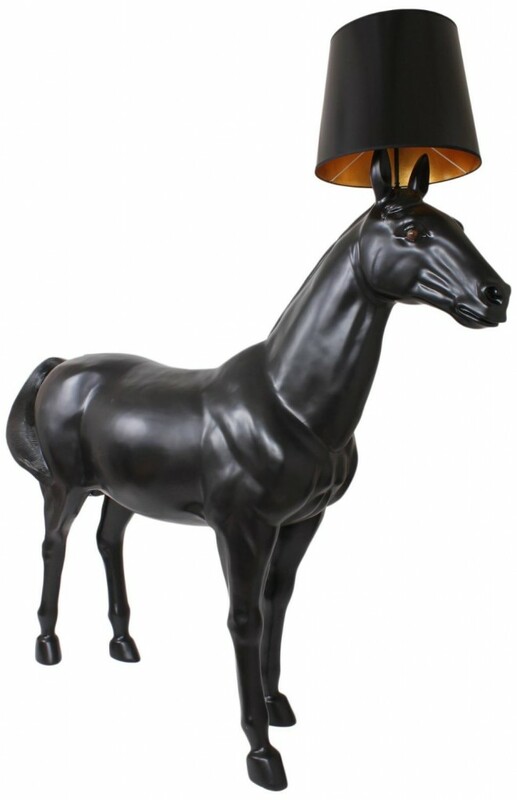 It is a gigantic gorgeous life-size black horse floor lamp home! It is a full size replica of a real horse! I bet everyone in the family will want a picture next to your horse floor lamp! Can you imagine having him in the middle of your living-room? All your guests will let out a scream the first time they see him! If you absolutely love horses and love horse sculptures, then it doesn’t get any better than this! *I hope you enjoyed these cool and unique floor lamps from this page! The Most Unique Table Lamps!